An Arts Envoy delegation from the United States is visiting Samoa this week. The U.S. Embassies in Apia and New Zealand have partnered to bring hip hop group iLuminate to both countries with the aim to promote Science, Technology, Engineering, Arts and Math (STEAM) to our communities. iLuminate first rose to fame on America’s Got Talent. 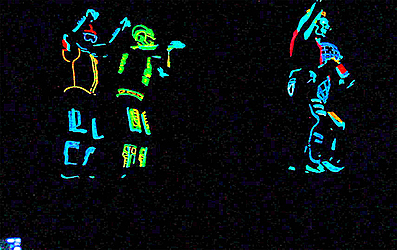 iLuminate fuses patent technology and hip hop dance using dancers in electrified glow-in-the-dark suits to perform choreographed dances and illusions. During their time in Samoa, iLuminate plans to conduct school visits at selected schools for both Upolu and Savai’i. Based in New York City, iLuminate dancers are hoping to share the positive effects of cultural diversity on urban culture, best practices for public engagement, entertainment administration and performing, and talk about their struggles as aspiring artists and how they overcome them. In addition to that, the team will discuss the science behind their costumes and interact with youth through dance workshops. It is evident that hip hop culture strongly resonates with Samoan youth, the Pacific islands and the world and so this project aims to explore partnerships with educational and cultural institutions to promote broader networks and innovative community leadership. Given that iLuminate is promoting science, technology, engineering and math through the art of hip hop, the U.S. Embassy believes that this is a great opportunity for schools to see acreative fusion of these subjects at such a high level. Working together to help facilitate the visit is Seiuli Allan Alo and the USP Alafua Pacific Outreach Programme for Polynesia (POPP), the Ministry of Education Sports and Culture, U.S. Peace Corps, Samoa Quality Broadcasting Limited and Samoa’s Best Dance Crews.